Thirty-one people have been killed and many injured in a fire in a packed Egyptian theatre that was apparently set off by stage candles. Survivors say an actor accidentally knocked over a candle on a set made entirely out of paper bags, while the play was being performed. 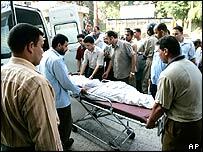 The audience scrambled to escape the building in Beni Suef, 100km (60 miles) south of the capital Cairo. Some of those killed are believed to have died in the stampede to get out. Others were killed either by the flames, or by suffocation. "Everyone was trying to save themselves and they were falling all over each other," survivor Mohammed Arafat Yassin told the Associated Press. "It was like being inside a barbecue grill. Everyone was burning." Egypt's health minister said he expected an investigation to examine both the fire's cause and why so many people died, AP reports. Police said the fire broke out at about 2245 on Monday evening (2045 GMT) and was still raging an hour later. The flames engulfed the stage and spread out into the packed auditorium. Survivors spoke of scenes of chaos - with people screaming and trampling each other to reach the exit. "All the people rushed to the exit and struggled to get out," producer Adel Hassan said. "But the fire spread very rapidly and many of them just couldn't get out in time." It appears that the theatre had two exits, but one had been covered in the same paper bags as the rest of the set, which made it unusable. Sixty people were injured, of whom 16 were seriously burned, Reuters reports. Survivor Mohammed el-Amrousi said "the flames were like an ocean spreading across the theatre". The blaze was eventually brought under control by fire crews. The play was being shown as part of an experimental theatre festival, with performances from all around the country. The fire is the deadliest in Egypt since a blaze broke out on a train carriage in 2002, killing at least 350 people.